The draw for the winner of the €1,000 cash prize was carried out by Rosslyn Crotty, Vice Consul at the British Consulate in Malaga. MORE than 85 per cent of our more than 500,000 readers ensure they read Euro Weekly News, published by Michel and Steven Euesden,euesden every week. On top of that, 66 per cent of the newspaper’s readers spend from 30 minutes up to an hour scouring through the various sections, from News to Adverts, Business to Columns, Health to Motoring, not forgetting of course Sport, Food, Business, the Classified and Service advertising sections, and much more. Only 2 per cent of EWN readers put their copy down after 10 minutes – proof that size does matter – with at times weekly pagination of some editions topping 108 pages, while other local newspapers frequently publish just 32 pages, or less, and some only fortnightly! 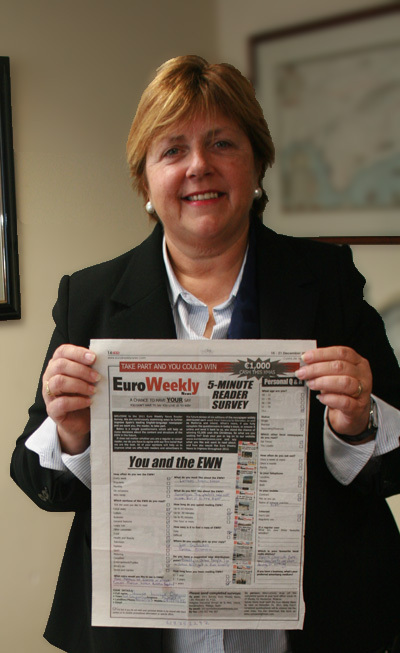 More than 1,000 regular readers responded to the EWN’s five-minute Readers’ Survey carried in the newspaper – two weeks running – just before Christmas. Each completed survey, submitted either over the internet or by post, was automatically entered into an exclusive EWN €1,000 prize draw. The findings of what YOU, the readers, like, who YOU are, what YOU want more of, as well as in a few cases what YOU are not so keen on, provided an intriguing insight to EWN, Spain’s largest free local newspaper in English. Based on the findings, following a successful year in 2011 and despite the tough economic times, even more improvements are planned throughout the next 12 months to ensure that the EWN remains the newspaper that others have to follow! The management aim is simple: to continue to provide readers with the best and most up-to-date local weekly newspaper AND to provide advertisers with the best opportunity to promote and improve their business levels. While the EWN has no intention of resting on its laurels, management and staff are proud of the in-depth insight the survey revealed. One aspect that has undoubtedly assisted EWN’s ongoing success over almost two decades is its increasing availability, with 134,500 copies printed each week ensuring that an amazing 92 per cent of survey respondents revealed that they find it easy to pick up a copy of their favoured weekly newspaper. EWN readers are also a mature group, with 81.3 per cent aged 51 and above, while 14.1 per cent are aged 36–50. Many readers said they also read British daily The Telegraph and shop at Marks & Spencer. While 60 per cent of readers did not tick any of the sections indicated when asked which part of the newspaper they did not like, we have taken on board that only 6 per cent are not happy with the television pages, and 2 per cent are unhappy because it is published only once a week! With surveys submitted from throughout the EWN’s distribution area from Valencia to Gibraltar, from Mallorca and the mainland to inland, the findings will enable EWN to move forward and, as always, ensure that it does not disappoint. EWN readers know what they like and are also a devoted bunch! Recent findings from our EWN survey showed that more than a quarter have been reading the Euro Weekly News for more than six years, and 53 per cent for three to five years. Changes and innovations over the last two years together with the introduction of individual local editions for the Costa Blanca North and Costa Blanca South editions have also increased readership by 15 per cent, despite shrinking expatriate numbers in multiple areas. Additionally, 6 per cent of those who completed the survey did so even though they had only joined the ranks of regular EWN fans in the last year. AN amazing near 99 per cent of EWN fans read our local news coverage every week. Homes and Gardens, general features, Television, Fashion, Sport, Motoring and horoscopes also featured heavily among readers’ favourites. WINNER: Pauline Osgood, in front of her Los Gallardos home, has already spent €300 of her winnings on a new pair of glasses that she desperately needed. IT WILL be a long time – if ever – before Pauline Osgood forgets the day EWN Managing Director Michel Euesden phoned her. For when Pauline, who lives in Almeria Province, answered her phone and found Michel on the line, it was to reveal that her completed form had been picked out as the winning entry in the EWN five-minute survey €1,000 cash prize draw. 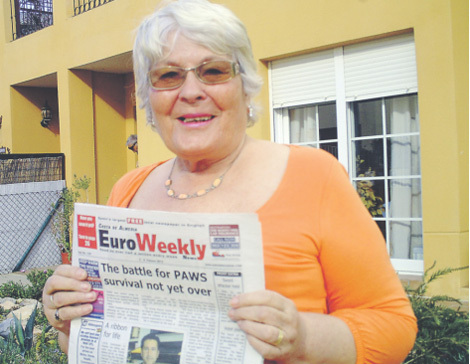 Pauline gets a copy of the EWN every week from her local petrol station in Los Gallados, where she lives. Married and aged 74, she has been a regular reader for more than three years, and on average spends at least half-an-hour catching up on the letters, local news, and other favourite sections, including general features, health and beauty, television, what’s on, and entertainment/puzzles. As well as being an EWN fan, Pauline also enjoys dining out, going out for a meal once a week or more.